We went to downtown Cardiff again. Well, at least on the same general route downtown. There were a few sites on the way. commercial stunt. Wait. I live in the US! The big surprise was as we neared Cardiff University, we noted a large number of film production trucks, trailers, etc. It was Doctor Who! The guards were very friendly but didn't let us too close. We saw no stars and the Doctor was apparently off in the TARDIS somewhere (or in the vault in the basement with Missy). 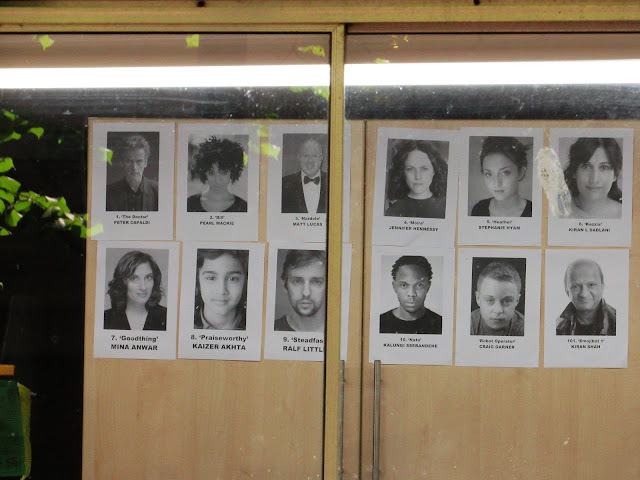 However, we did confirm that it was the Doctor's crew. 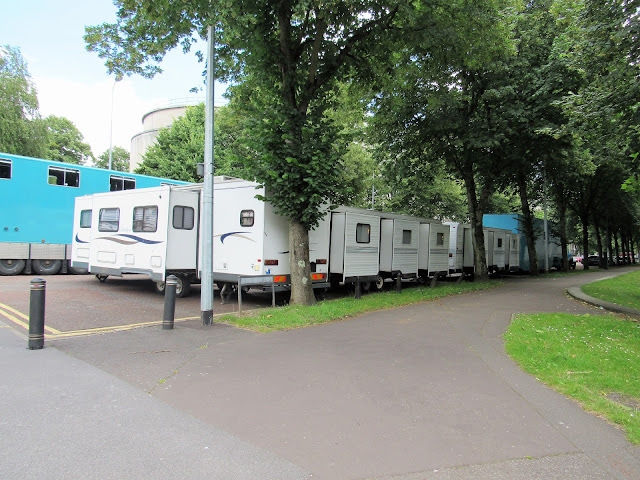 Zooming into the make-up trailer, we recognized some of the actors and confirmed the Doctor. If Jenna Coleman's pic had been up, I would have hung around and waited no matter how long it took. Best she wasn't. No need for creepy old man stuff. Except the reason I like her is that she reminds me of my wife when we first met. "Run, you clever boy! And remember!" 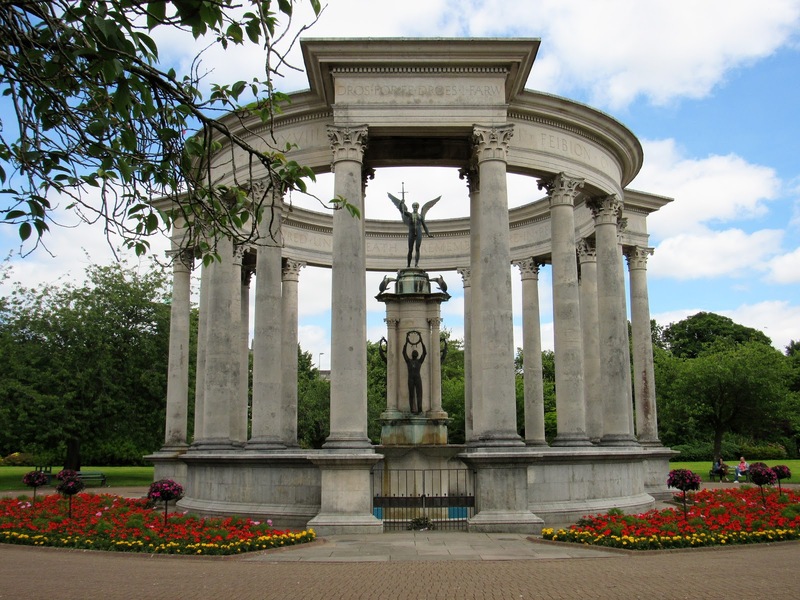 It has become the Welsh National War Memorial as sadly, that was not the War to End All Wars. But, "Don't blink!" Yes, it was in that episode. Linda and I did the tour of Cardiff Castle. 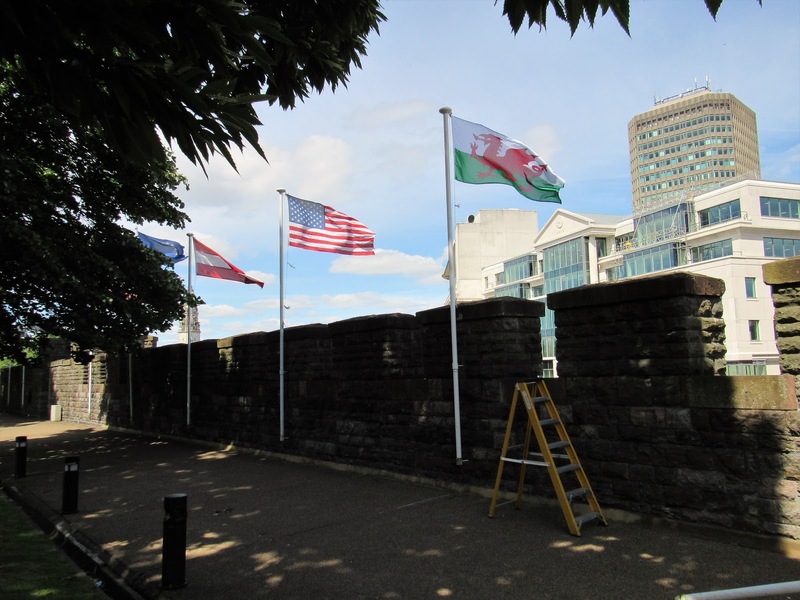 Most days, you will see international flags all around the castle wall. The wall is a large rectangle because it was originally a Roman fort and the Romans usually built in square angles. The day we were there, they were changing out all the other flags to fly only the Welsh flag because Wales was still advancing in the Euro Cup Football Tournie against all expectations (and much thanks to Gareth Bale). Below, they had just taken down the Italian flag and put up the Red Dragon. We watched them remove the US flag as well which was really weird because I wanted to go up and help them fold it right. But it's their country, and they can do what they want with our flag. 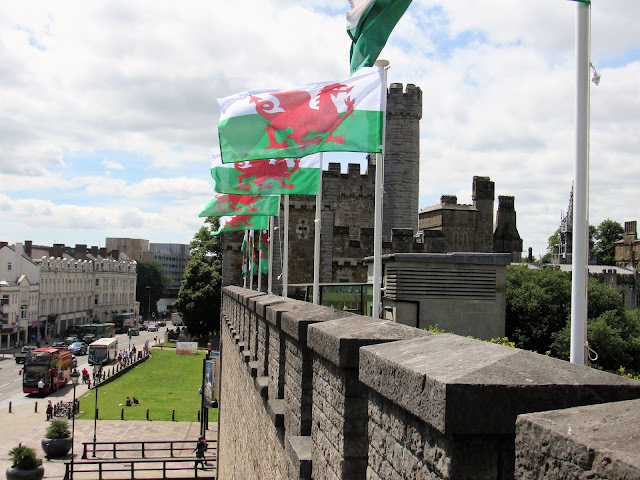 It's a nice gesture that they generally fly the flags of all nations as Cardiff is a welcoming, international city. What so proudly they waved! 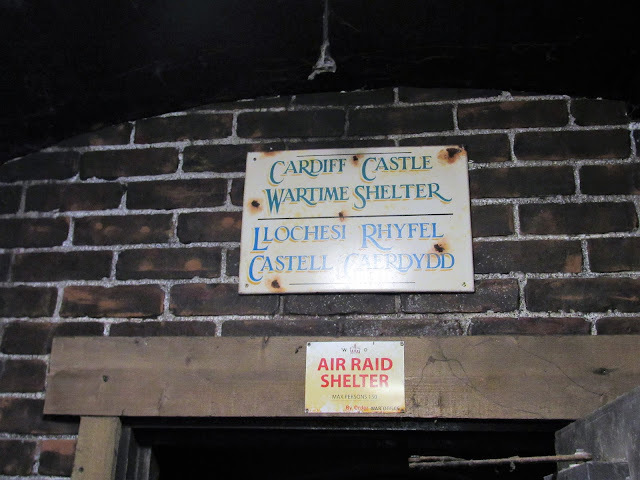 We learned that the inside of the stout outer walls of the castle complex were used as air raid shelters during World War II. They had some exhibits in the dark halls. This one's for my many Idaho friends and family. We forgot to count the steps. 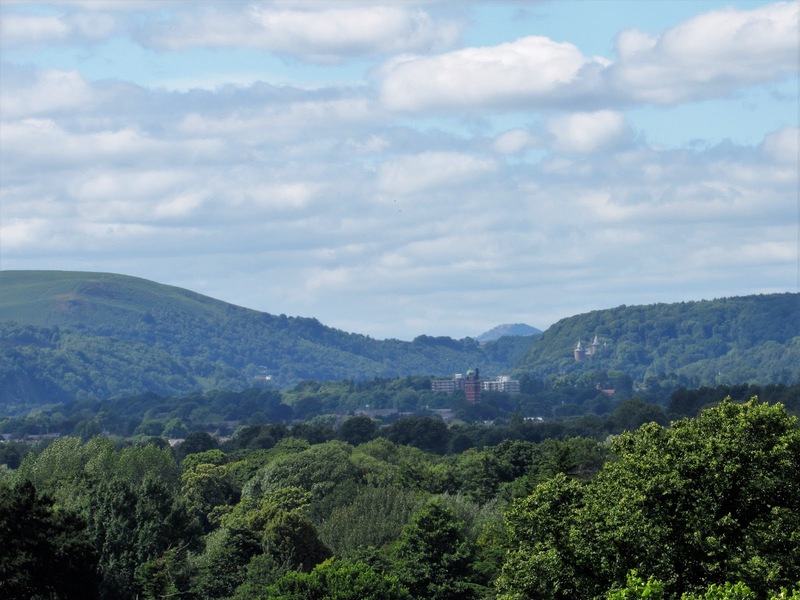 Looking to the north towards the mountains and valleys of industrial Wales. 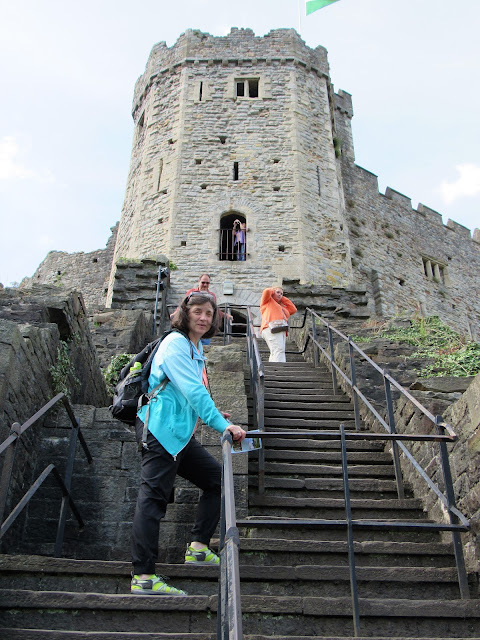 On the hillside to the right is Castell Coch which we shall see later. Cardiff Castle has been around for a couple of thousand years. 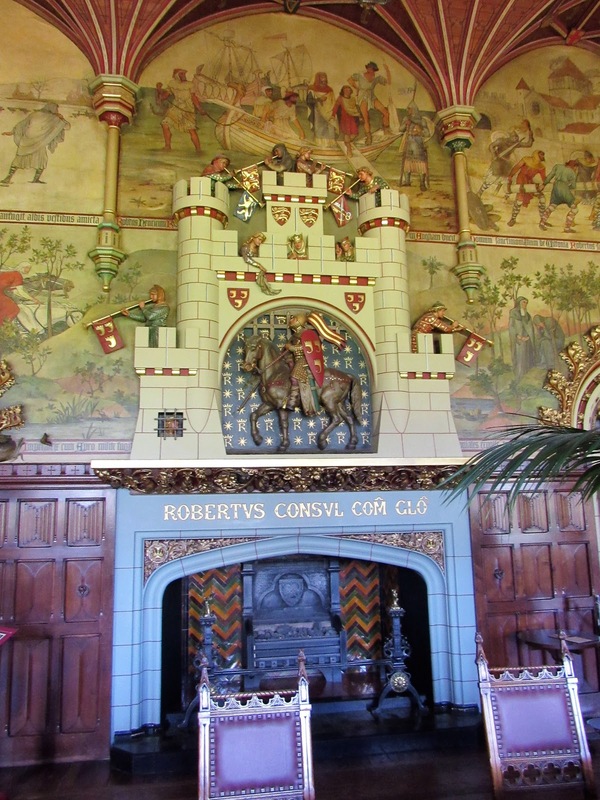 Roman Fort, Dark Ages Hill Fort and Wooden Palisade, Medieval Castle, and Victorian Mansion of the Bute Family, Lords of Glamorgan by marrying into the County. They were actually Scots and got lucky not just by marriage and accidents of birth, but because the geography they controlled was full of coal and iron. Yep, they got filthy rich off ground rents. They were a step above and removed from the Capitalist Iron and Coal Masters, and as their wealth piled up, they found themselves richer than the royals. 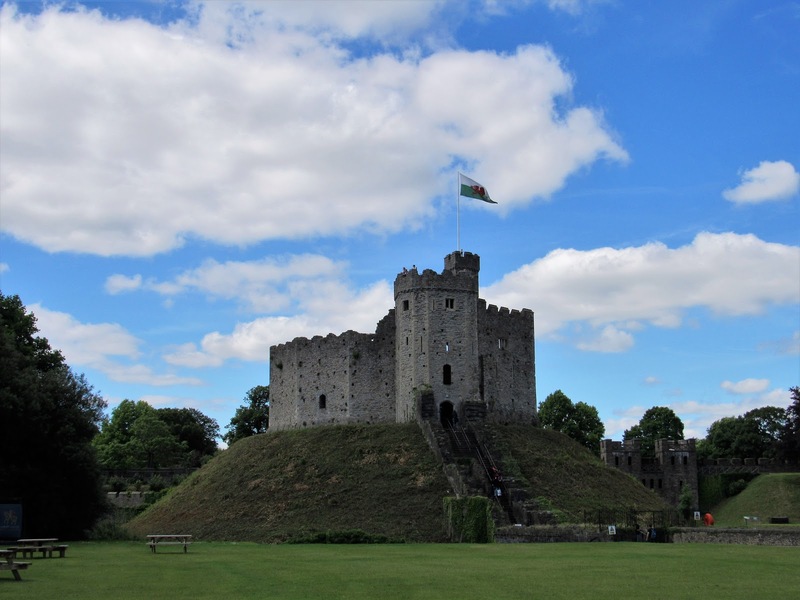 They did establish Cardiff as the coal capital of the world and put a lot of money into infrastructure, schools, and the arts. Still, the working men, women, and children of Glamorgan could have used a bit more respect and economic benefit from their hard labor and life-risking and draining work. 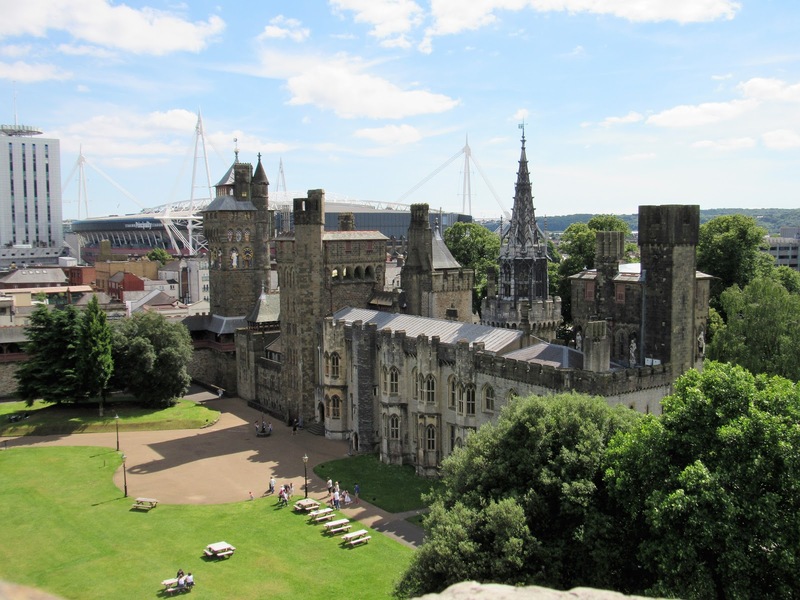 The next view looks over the Victorian home of the Butes to the modern city beyond the walls including the Millennium Stadium. The guide was very proud to tell us that our President Obama had dined here at a recent NATO Summit. 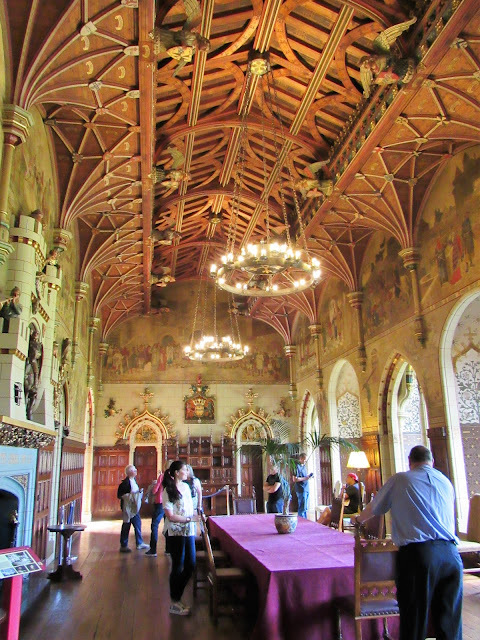 He also encouraged us to book the place now for our 50th Wedding Anniversary. I think we'll leave it to Presidents and royalty. I would like to have this fireplace, though. 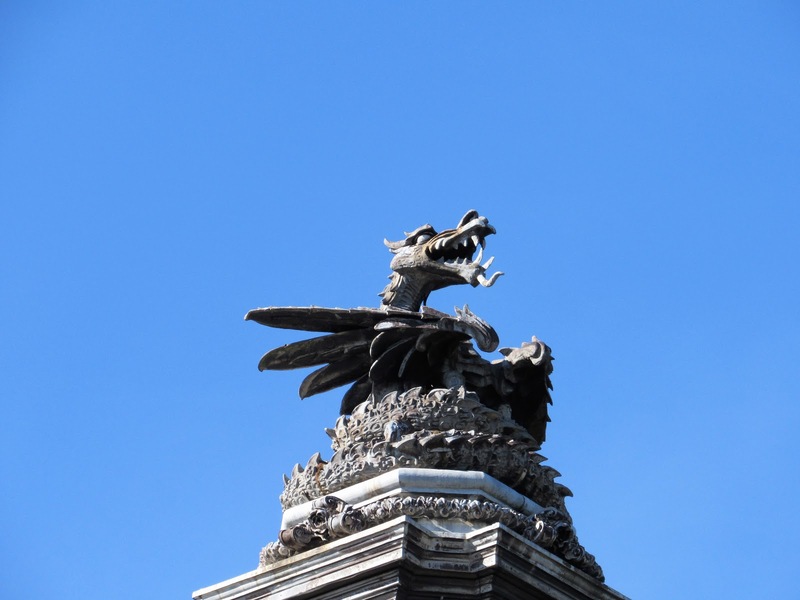 While not having so grand a fireplace, I do now have a dragon on my roof that is pretty much as good as this one on top of Cardiff City Hall. 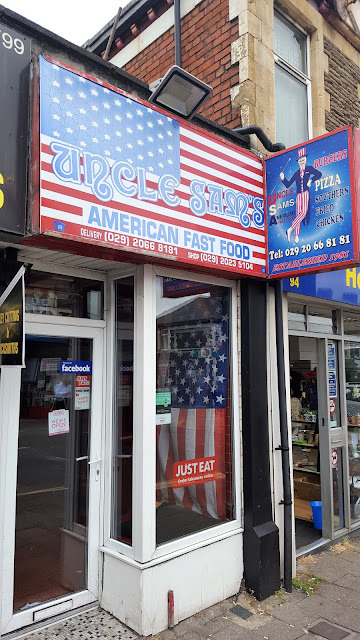 I keep telling myself that some day I’ll eat at that Uncle Sam’s place. 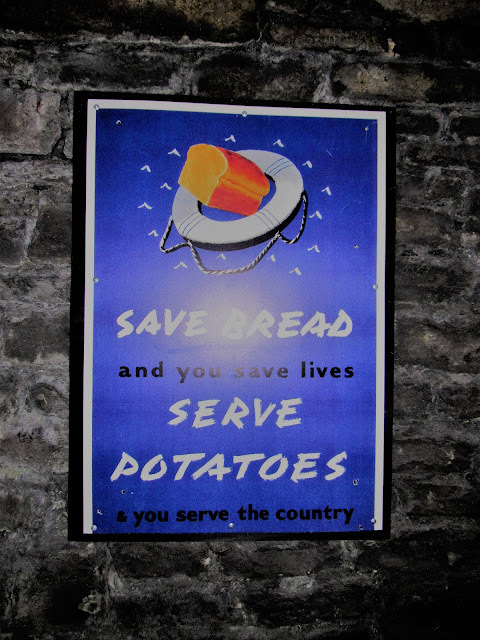 But there keeps being too much good local food to remember to bother! Yes. It does make me curious, though. I had a companion in Brazil who argued with a guy making hamburgers after he asked him the difference between a "burger" and a "xisburger." The guy had explained that the "hamburger" had cheese ("queijo") in it and the "xisburger" didn't.